Football is one of the most loved sports. This is a game of intensified gamers backed by a crowd full of life and energy. Football fans are everywhere and they watch the game religiously. By the field, you have got fearless looking players with helmets and padded shoulders. The games are about to start and thousands are watching it at home as well as in flesh by the field. Having discovered that this is one of the entertaining and most loved sports, it makes sense to use its ball as a marketing front. This can help you reach out too many football lovers. You can take advantage of this amazing football which comes in red. The visible stitches are coloured in white. This is a beautiful squeeze football that can be used as a stress reliver or a time pusher during boring times. This is the best product to use for your brand promotional campaign as it can keep your targeted market. The ball is soft in nature and presents a satisfying feeling when squeezed. 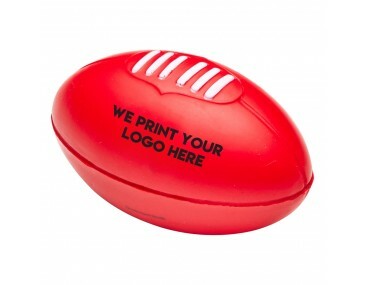 With the ability to brand the ball with a customized company image, the ball becomes one of the best tools to use when planning a brand promotional campaign. Goods takes 2 weeks upon approval of payment to be delivered. Branding set up of $60 applies per colour print. Prices listed exclude Australian GST. Delivery of goods offered is throughout the Australian territories only.